No, this post is not about bathing everyday or keeping your hair nice and neat. It's about my early work on Zomm B. Grum'e and a little bit about July 4th. 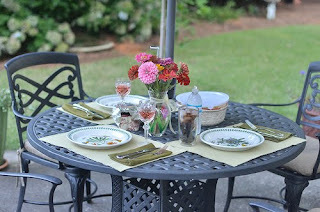 Just to go back a few days to the 4th, we had a lovely supper al fresco before heading to downtown Augusta for the fireworks display. 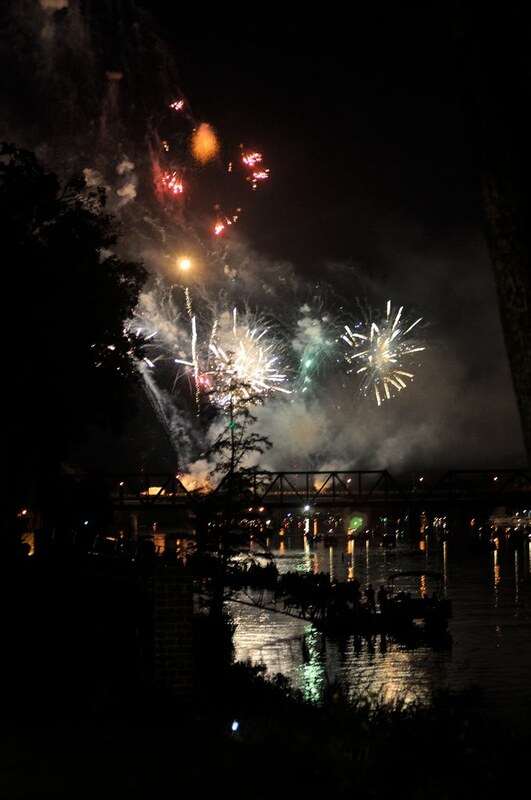 We watched the fireworks from the South Carolina side of the Savannah River looking across to Augusta. There was no way we were going to be able to park near downtown and ended up parking in the very nice River Club neighborhood across the river. We found an empty lot along the river and set out our blanket and chairs. The nice folks who lived next to the empty lot invited us in to their front yard so that we could have a better view of the fireworks - no trees to block our view. I thought that was such a hospitable gesture. It was a great evening topped off by a really great (if I do say so myself) blackberry cobbler. I finally began stitching on the Groom Monday afternoon. I completed all of the cross stitches on the pumpkin. The overdyed DMC floss is so perfect for this. Yesterday and today I worked on his face, hat, and bones. I particularly like his hat - a fedora? It reminds me of something the Phantom of the Opera might have worn. Maybe they shopped at the same Men's Warehouse? The sparkly black/purple Kreinik used as the lining of the brim doesn't show up so well in photos but is very effective in person. The purple velvet lapels are a nice touch, too. I think tonight I'll move on to the vest or coat. Peggy had a great tip at the Study Hall for working with Neon Rays. Use a small curling iron or flat iron to straighten the folds out of Neon Rays. I bought a small flat iron at Target yesterday for $14.99 - small enough to keep in my stitching bag. It worked beautifully! I've never worked with such a nice flat piece of Neon Rays. It was actually a pleasure to work with. Give it a try! Just wanted to let you know how much I enjoy reading your blog. Your groom is very handsome. Great stitching.